Each foot has five metatarsal bones, the long bones behind each toe. The metatarsal bone behind the big toe is called the first metatarsal, and so on. Deformities or injuries of any one of these crucial bones can cause excruciating pain and significantly affect your mobility. If other treatment options prove ineffective in resolving such pain, surgery is a viable potion. 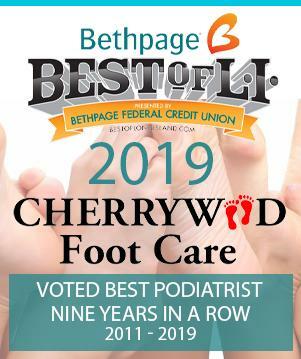 Cherrywood Foot Care is Long Island’s metatarsal surgery expert, specializing in this important procedure with the skill and surgical precision that can only be derived from decades of experience and understanding with both the condition and patient’s needs. Metatarsal surgery is used to correct a number of foot problems. Most commonly it is performed on the first metatarsal for the correction of bunions. Surgery on the second through fifth metatarsal bones is performed infrequently, and is usually done to treat painful calluses on the bottom of the foot or non-healing ulcers on the ball of the foot. Patients with rheumatoid arthritis may also need metatarsal surgery. During surgery, the metatarsal bone is cut just behind the toe. Generally, the bone is cut all the way through, and then manually raised and held in its corrected position with a metal pin or screw. Following the surgery, the patient’s foot may be placed in a cast. In some instances, a surgeon will also cut out the painful callous on the bottom of the foot, but most prefer to do the procedure in an outpatient setting. The knowledgeable and experienced team at Cherrywood Foot Care will ensure you receive the best and most effective treatment for all your metatarsal-related needs.